Does hi-res audio sound better than CD quality? Let's discuss if there is a need for compressed audio data when CD quality is good enough. Is there still any need for compressed data? As far as I can tell, no one has ever in a double-blind test been able to recognize anything better than CD-quality uncompressed audio. MPEG adds features that can be identified with practice. In theory, FLAC doesn't, but the mere act of decompression can lead to jitter. As in this day and age there is no need to compress CD quality, then why bother? It may be worth having higher bitrate and depth on audio recording/processing, but for listening purposes, CD is as good as you need or indeed can get. These are all interesting points and well worthy of consideration. Let's take them point-by-point. Do we need compressed audio data? For me, at least, the answer is a clear yes. I do most of my day-to-day work on my fine, gracefully aging, System76 Gazelle laptop. Some years ago, I replaced the 500GB 7200RPM hard drive with a 480GB SSD. As far as I could determine at the time, my best bet, in terms of performance and reliability, was a SanDisk ExtremePro, which especially appealed to me because of the included 10-year warranty. So, of the 480GB provided by my SSD, 237GB is taken up by music. That leaves me another 200GB for the system and my work, with a bit of a buffer. If I moved from FLAC to WAV, that would more or less double the amount of space needed, which would leave me no room for work (or worse). I could buy a 1TB SSD but, or I could replace the CD/DVD ROM drive so I can rip the occasional CD and create the occasional DVD-RW backup. Practically speaking, therefore, I'm going to be living with FLAC files on my laptop for now. Recently, I bought a wonderful standalone digital audio player, the xDuoo X3 II, from Massdrop. This is a fine-sounding device, built around an AKM4490 DAC chip. In terms of functionality, it's basic—no touch screen, no WiFi, no Android—but it works well and sounds great. It plays PCM (FLAC, WAV, whatever) up to 32-bit / 384 kHz, as well as DSD stream files (DSF) up to DSD128, so it more than covers my needs. It uses a MicroSD card to store music files and my laptop has a MicroSD writer, so I'm good to go. I can copy my music library from my laptop to my new 256GB MicroSD card and enjoy my music without having to rip it to MP3 or some other lossless format. But that 256GB MicroSD card is pretty darned full, so good thing I'm using compressed audio data, i.e., FLAC format. In summary, I need around 250GB of storage for my music collection and 500GB SSD and 256GB MicroSD cards are at a decent price point. So, yes, compressed audio still matters to me. In a double-blind test, can anyone recognize better than CD quality? There are two issues here. The first is the idea that double-blind testing is the ultimate way of detecting differences in audio reproduction. The second is being able to recognize differences between CD-quality and higher resolutions. Let's take them one at a time. I get the importance of double-blind testing in general, but I also get that it's very simple to demand it as the gold standard in detecting audible differences (between different input data, between different equipment, between different rooms…) without necessarily being aware of all the moving parts. First, let's think about what "music enjoyment" means. Evidently, lots of people enjoy their music over $5 earbuds and smartphones. At the other extreme, some people spend many thousands of dollars to equip their listening environments. I submit that not one of these people spends a great deal of their time doing double-blind A/B/X testing to assure themselves that their source files or equipment or listening environment or the phase of the moon is making any difference to their pleasure. Instead, they are in a zone, perhaps taking the bus or exercising or cooking to background music, perhaps listening intently to the music and avoiding other distractions. So how does the act of double-blind listening mimic, in any meaningful way, the act of enjoying music? Turning that question around, who feels comfortable knowing that a panel of people with different and unspecified levels of education, musical interest, familiarity with instruments' sound (be they real or electronic or something else), interest in listening critically, and "taste" (whatever that is) can somehow tell us that there are (or aren't) meaningful differences between component A and B or file X and Y? 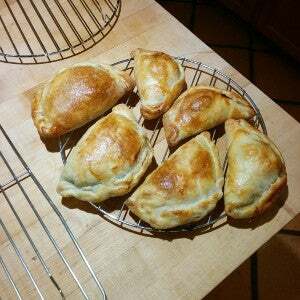 As I get older, I find I really detest background music except when I'm cooking—how could a person possibly make empanadas that look this good without Violeta Parra playing in the kitchen—or when people stop mid-sentence and say something like "Wow! I'm really digging this music you're playing." Instead, I save my music listening for when I'm alone and can savor what I'm hearing. Moreover, I recognize my process of music appreciation has changed, and I have very little interest in whether a panel composed of people who listen to Spotify or MP3s on cheap earbuds can tell the difference between a CD-quality version of a given album and the high-resolution equivalent. It's just not relevant to me. I've played guitar since I was seven years old and I'm almost 63. I know what a guitar sounds like as my head is hanging over it and I hear what I'm playing. I know that it sounds wonderful in the bathroom, less so in the bedroom. When I hear a well-recorded guitar, whether it's on LP, or CD, or high-resolution digital, I know that it's well-recorded. When it's not well-recorded… no surprise, it doesn't sound like a guitar; it sounds like a mediocre recording of a guitar. But I don't know what a cello, or a violin, or a Moog XYZ really sounds like. I haven't spent much time listening to these instruments, and I certainly haven't critically or carefully listened to recordings of them to detect differences. Have those focus groups listened critically and carefully and with a lot of prior experience? Who knows? Beyond that, what about recordings made, let's say, without great care? Is the quality of those recordings in 24/96 going to be much better than the 16/44.1 versions? Is there a true difference in the content between the high-resolution and the CD version? And finally, what about the equipment? Is it really up to reproducing the differences that could be detected in a double-blind test? Could, as some people suggest, the equipment's bandwidth make the high-resolution recording sound worse (rather than the same or better)? So, double-blind testing. From my perspective, unless all the variables (including ones I haven't considered) are carefully and properly controlled, who knows? When someone figures out a way to double-blind test the way I use music, maybe I'll be more convinced. Has anyone recognized a difference? Here we are on more solid ground. Apparently, people have recognized the differences, as suggested by Joshua Reiss' AES meta-analysis. There's also "Inaudible high-frequency sounds affect brain activity: hypersonic effect," an article I find fascinating perhaps because it's so wonderfully clinical. Reiss' paper is particularly interesting to me because it (scientifically) discards an early paper that purports to show there is no audible difference in medium- and high-resolution files. It says, "[r]esults showed a small but statistically significant ability of test subjects to discriminate high-resolution content, and this effect increased dramatically when test subjects received extensive training." In other words, the average person can hear a difference, and people who have invested in carefully training their hearing can clearly hear differences. Before we can determine whether we can hear a difference between a high-res, CD, and MP3 version of the same recording, we need to ask: "Is there actually a difference"? Open source to the rescue! 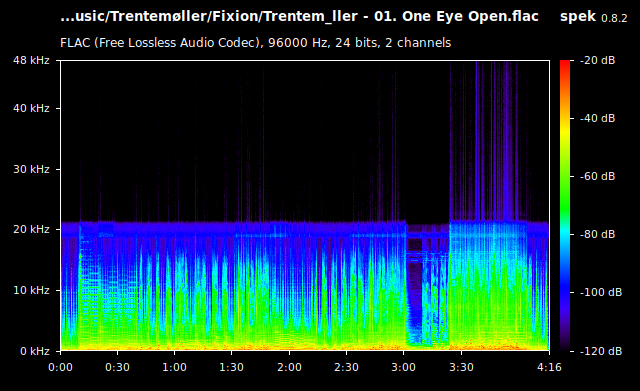 Spectrum analyzer Spek is one of my favorite tools for checking the so-called high-resolution music files I buy to make sure they can legitimately be called high-resolution (and yes, I have complained to the download stores when I've found their high-res files wanting). I don't know if Spek's Fourier transforms are perfectly executed (although because it's open source, I could find out if I wanted to). Nevertheless, Spek tells some interesting tales. Look at the overtones out there up to 40kHz+. Think about filtering those to fit into 16/44.1 PCM. Now think about analog-to-digital and digital-to-analog conversions that might—or might not—cope well with the overtones at 15kHz to 25kHz. Slow filters (that don't get rid of aliasing errors), fast filters (that get rid of aliasing errors but may introduce phase shifts)… who knows what happens when producing a CD-quality version of this file? Wow, look at that cutoff just above 20kHz! There has to be some serious filtering happening to make this track suitable for 16/44.1 CD quality. Moreover, we are accustomed to higher frequencies at a lower level; look at the "green stuff"—it's in the -60dB to -70dB range, that is, only 10dB to 15dB louder than the overtones (again, a factor of two to three times as quiet or as loud). Do we hear the green stuff? The yellow stuff? The cyan stuff? I don't know. I could paste a bunch more Spek screenshots that show content above 20kHz, as well as ones that show a brick wall filter. But my main point here is: Don't expect your 24/96 (or higher) files to have a ton of high-resolution content—sometimes, they don't! What about comparing CD-quality and high-resolution versions of the same song? In the 24/96 version, there is quite a bit of content above 20kHz that lies between -60dB and -70dB, which is not all that far down. That content was filtered out in the 16/44.1 version to get it below the Nyquist limit. 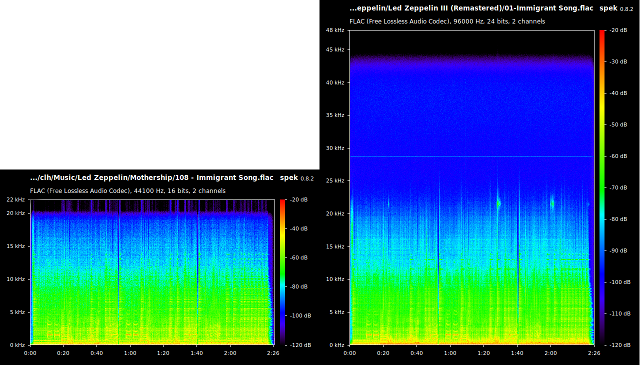 So, using the Spek test, this track looks like a decent candidate for comparing CD quality and high resolution. However, there could be other differences between the two versions. For example, one version could be compressed more than the other or its overall level could be set higher. Compression (which involves moving the signal level closer to the maximum—0dB—differentially, so very quiet passages are louder and loud passages are right at the limit) is often done to make tracks sound louder on broadcast media, which is deemed by some broadcasters to be appealing (see Wikipedia's entry on loudness wars). This is apparent in the version of "Communication Breakdown" on Mothership, where the peaks during the intro appear between -3dB and 0dB, compared to the one on Led Zeppelin I (Remastered), where the peaks appear between -6dB and -3dB. In other words, the intro on Mothership is twice as loud as the intro on I. You can see this difference by using a great open source audio player (like Guayadeque) that has level meters. Another example: Older music was often mastered with the bass turned down because heavy bass was not playable on cheap record players in the 1970s, and when it was remastered the bass may have been turned back up. This can be tested with a spectrum analyzer that shows levels at a given instant. Audacity has a plugin that appears to offer this kind of measurement. Or, there could be other changes that make two song versions sound quite different. "Communication Breakdown" on Mothership has been remixed so that the intro guitar riff is solidly in the center of the stereo image, rather than off to the left as it is on I (Remastered). It's relatively—and unambiguously—simple to detect balance reconfiguration with my ears, but it can also be perceived as level differences between channels when comparing one version to another. In summary, it's going to be really difficult to ensure that "the same song" pulled from different sources at different resolutions sound different because one is CD quality and the other is high resolution. A better approach might be to start with a high-resolution track with real high-resolution content, then filter and downsample it to CD quality. But this only addresses the question "should I buy the CD-quality or high-resolution version?" when you're talking about the high-resolution original with true high-resolution content that's been filtered and downsampled to CD quality. There isn't an easy way to sort this out, at least from my point of view, but I prefer to be cautious: I'd rather buy high-resolution files when possible (yes, I always buy my music). My absolute favorite combo is 1) buying an excellent LP, and 2) finding a coupon inside for a high-resolution digital copy as a part of the purchase price (thank you, Nils Frahm and others). Then, one day when I have lots of spare time and fancy equipment, maybe I'll be able to convince myself I can hear the difference. In the meantime, I know I'm not being cheated of the full glory of the performance because I selected the 16/44.1 instead of the 24/96 version. OK, enough ranting about high res vs. CD vs. MP3. Let's talk about the music because that's what really matters, right? I've mentioned Lenine in the past, specifically his album O Dia Em Que Faremos Contato. My first contact with Lenine was a CD I picked up at Starbucks "quite some time ago" (if you remember buying CDs in your coffee shop, you can probably figure out how long ago this was), which included a track from another Lenine album Na presão, "A rede." Give this a listen; what a fantastic track, what a fine album! Mine was originally on CD, but I've since ripped it to FLAC and stored the backup in the basement. If you (like me) have a special spot in your heart for Jimi Hendrix, you really need to hear Tangerine Dream's version of "Purple Haze." Oh dear, this is beyond crazy! You can find it on their 1992 tour album, Live in America, on 7digital, a wonderful, Linux-friendly digital download site. Finally, after listening to a radio edit of "Sharing" on a compilation album for a number of years, I picked up the Bugge Wesseltoft album Sharing on 7digital; although it appears to have vanished in Canada, it's still available—at least in the United States and New Zealand. This is beyond fine music; I encourage you to check out the rest of Bugge's work, as anyone that offers a New Conception of Jazz merits some serious study. What defines a top-tier, open source music player for Linux? MP3 compression adds features to music that people can identify - double blind testing of MP3s shows that people can tell the difference between 16 bit and 24 bit. No-one has ever successfully identified differences in 16 bit and above or CD and higher sample rates of uncompressed files. If I was in a recording studio I would probably use higher bit rates and sample rates to give me the overhead for processing and reducing possible feature in effects but for pure listening a CD has never been bettered. If you understand the maths of sound you will realise that simple draughts in rooms have more effect on sound than an extra few bits. Thanks for your comments, Tom Potts. However you are incorrect when you state "no one has ever successfully identified difference s in 16 bit and above or CD and higher sample rates of uncompressed files". I direct you to the Audio Engineering Society metastudy I mentioned in my article. With regard to recording at 24 bits, I prefer to receive my music in that bit depth rather than being massaged into 16 bits. YMMV! 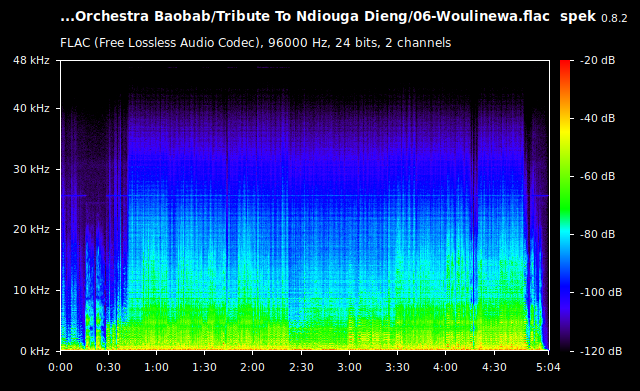 The problem with testing high resolution audio (as you mentioned) is that it is almost never the same recording. When high resolution content is released, it is almost always remastered/remixed. Which means any attempt to compare it with the original CD release is going to be comparing the mixing/mastering work, which is likely to overwhelm any differences that result from the resolution. A better test, which I don't see done very often is to start with a good quality high resolution source. Then downsample to 16/44. This way you have two recordings (the original and the downsampled version) that are of identical mixes, with the only difference being the resolution. Now you can perform an ABX test between the two and be reasonably confident that any differences are the result of the resolution differences and not other aspects of the recording. Of course, if you perform this ABX test, you must make certain that the analog portion of your equipment (amplifier, speakers, etc.) is capable of reproducing the ultrasonic frequencies - otherwise none of the differences will be audible. And the levels must be matched - if one source is even slightly louder than the other, people will think it sounds better. But even then, there's no guarantees because these two digital sources will be using different DACs - a hi-res DAC and a CD quality one. Even if both sources play to the same physical box, the DAC chip will probably employ different circuit paths for different resolutions. It may not be possible to completely tease out the audio differences that result from the different resolutions from those that result from using different DACs. In other words, although we should be able to perform much better tests than people typically do, trying to perform a comparison where only the resolutions differ and everything else is equal is going to be an extremely difficult challenge. Thanks for the comments, David C. I agree with your points and your conclusions. Moreover, if the music in question was mastered at say 96/24 then I prefer to receive it that way, rather than further - and gratuitously - converted to 44.1/16. Conversely, if an album I want is only available at 44.1/16 or even MP3 then I'll take it the way it is. I would highly recommend you to read the posts from http://www.realhd-audio.com/?cat=45 and/or subscribe to Mark's newsletters, regarding this and other high-res audio topics. Thanks for the comment, Alex. Mark Waldrep has a wealth of experience with high resolution audio and is always interesting, sometimes provocative, with his ideas. I love FLAC files and prefer lossless and local (i.e. non-streaming) whenever I can. I felt compelled to comment because there was a relevant write-up at xiph.org years ago that convinced me away from the massively higher quality audio files (and required gear). I thought I'd share here as I found them quite informative (and that video is my single favorite technical video / demo I've ever seen to this day). Highly recommended. Thanks for the nice comments, Kyle. Please be cautious about accepting uncritically the xiph.org comments. The AES reference I mention in the article reviews the published results of trials and finds the conclusions about high resolution indicated in the xiph.org article to be incorrect. Personally, I find the idea, advanced on the xiph.org site, that we should avoid accumulating high resolution music because our playback equipment might struggle to reproduce it well to be a bit odd, too - why not instead advocate acquiring equipment that doesn't have problems with the high resolution content? Aaaaaaaaaanyway, YMMV as they say! and thank YOU for writing!